Guest or Non-Member with Reservation. Join today and save on your lunch reservations! 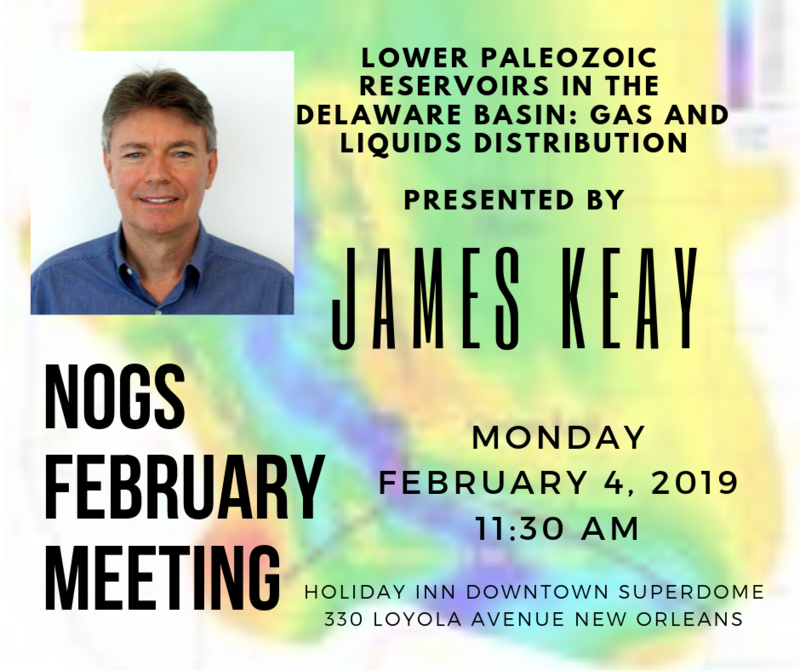 NOGS Member Luncheon - without reservation or walk in registration. We discuss early results of a project in the Delaware Basin aimed at providing a more comprehensive view of the distribution of gas and liquids. We focus on the lower Paleozoic section, which is well known for prolific dry gas production, and the study identifies an interesting area of deep gas liquids that may lead to similar play concepts. A detailed basin-wide stratigraphic framework has been built and well perforations are correlated to specific zones and intervals, enabling accurate assignment of public production data and EUR analysis specific to the producing zones. A basin -wide temperature model offers some insight to the preservation of deep liquids and recent 3D seismic helps characterize these deep traps. Mr. James Keay has over 30 years experience in international oil and gas exploration and business development. His background is in structural and reservoir geology, and his experience includes exploration throughout North and South America, field development and operations in Canada, and reservoir studies in Colombia, Kuwait and Canada. He has also held senior management positions in international consulting and business development. James leads a team of geoscientists at TGS performing basin and prospect scale analysis in support of TGS’s seismic project development. Along with technical evaluation of investment opportunities, the geoscience team contributes to seismic design and imaging, seismic attribute studies, well performance studies, and the development of new interpretation products.